At the Klickitat River Inn you are able to soak up the BEST views of the river while relaxing in luxury. This is a 1 bedroom/1 bath house that can sleep 2 people on a Queen in the bedroom, 2 on a Double Trundle Bed (pops up to be a King) and an additional 2 more on the couch & chair/ottoman combo. There is even room to put in an air mattress to accommodate up to 2 more. This place is truly magical and is the PERFECT staycation / vacation getaway! There is big country but little cell reception so please plan accordingly. No fear though, we have Wifi available on the property if you want to look up some fun activities, places to go or send out a few emails. Looking for something to do? Klickitat County and the Columbia Gorge have so many awesome adventures waiting for you! Or just simply relax and unwind with the soothing sound of the river. 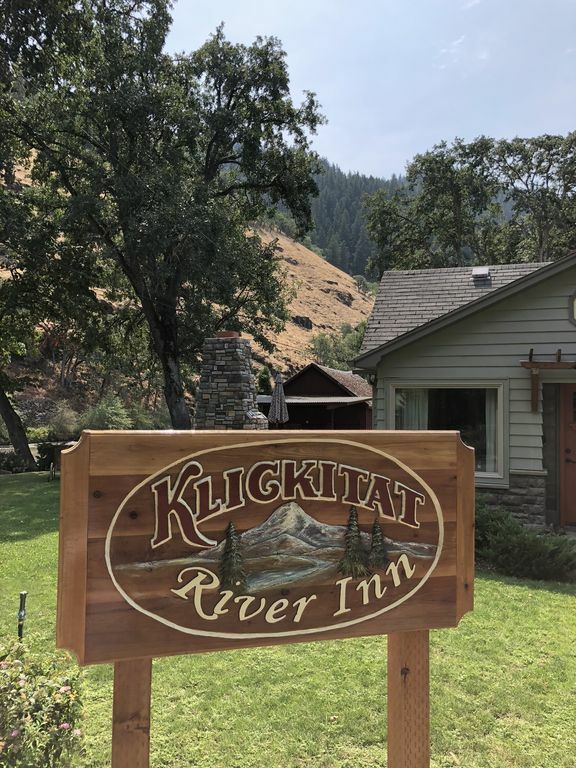 As of May 2018, Klickitat River Inn has new ownership and will be ran by Linda and Lindsay. This mother daughter duo are excited to provide amazing experiences for those who like to soak up nature and escape the busyness of life. It has been a dream of Linda’s to have something she could run close to home. When she found out her daughter Lindsay had decided to move back to Washington State after many years, she was so excited to have an adventure to share with her. Linda and Lindsay are co-managers of the Inn. Lindsay has always had a passion for Hospitality and has experience working in many different faucets of the industry in Sonoma County, from Wineries to Catering. Moving back to Washington State has given her the opportunity to put her passion and experience to good use by working with her mom to provide an amazing River Getaway experience at the Klickitat River Inn. Together they hope to provide their customers with a one-of-a-kind vacation to remember! Our property is nestled along the Klickitat River in the little town of Klickitat, Washington. The Inn was built in 1935 but has since been renovated with great modern updates that allow you to feel at home while escaping the busy working life. Klickitat River Inn has multiple accommodations and each one is special in their own way. As of now, we offer an amazing Main House and 2 Studio Suites with 2 more on the way. The property has an enchanting yard and patio areas that soak up great shade for those hot days, direct access to the river and lush greenery that enhance the amazing water views. This place is a Diamond in the rough. At first glance coming into town you are not quite sure what to expect and then you come upon this great property on the river. They have thought of everything to help make your stay comfortable and easy. Linda is great and extremely helpful. She even did some research for us on the area as we were looking for a fun snow area for our kids. It is a comfortable and cozy home that we would definitely recommend. Our stay in the main house was just what we were hoping for! We enjoyed a fire outside while listening to the river and watching the stars. Lazy mornings in the well appointed kitchen watching a couple deer on the hillside. Perfect when you need to get away from the city! Thank you so much for the awesome review! It's so nice to be appreciated for all our hard work. We look forward to you visiting with us again. We so happy you loved your time here with us at the Klickitat River Inn. We look forward to you staying with us again. Klickitat River Inn as pretty and peaceful as the pictures ! Idyllic spot on the Klickitat River , we stayed in the main house; completely furnished with everything you could possibly need, classy updated decor, yet warm and homey, and views of river were amazing from living area, literally steps to the river bank. Owners , Linda and Lindsay have taken great care in offering a special retreat. Do not miss this gem! Thank you Suzanne and Warren for your lovely review and all your kind words. It tickles us to hear we are doing a good job and making our guest feel right at home. We are so happy you enjoyed your stay with us. We were super excited that you were able to see the Klickitat Museum and reconnect with people from Warren's past. We enjoyed visiting with you and look forward to you staying with us in the future. What a lovely little house! It's right on the Klickitat, and my husband and I really enjoyed sipping our coffee as the river flowed by, and watching the stars at night. Well appointed kitchen, everything clean- it was great.